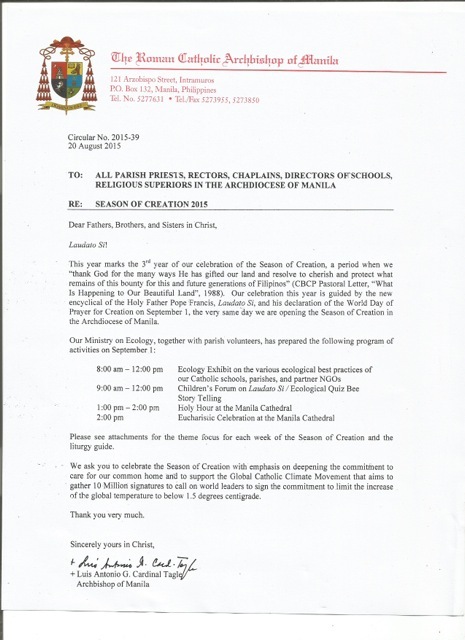 – Cardinal Tagle wrote a circular letter to the Manila Archdiocese calling for 10 million signatures for the Catholic Climate Petition (August 20). – Cardinal Tagle mentions the GCCM petition in his United Nations speech (September 24). 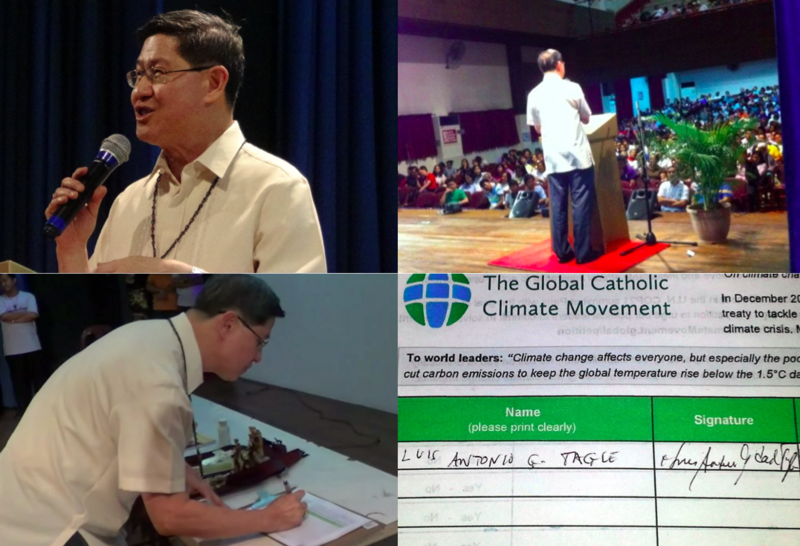 July 4, 2015 – The Catholic Climate Petition campaign was officially launched in the Philippines yesterday, with Cardinal Tagle and over 1000 priests, religious and lay leaders during the General Assembly of the Manila Archdiocese. Cardinal Tagle speaks during the launch of the Catholic Climate Petition, and kickstarts the campaign by signing the petition himself. This is the first step of a massive mobilization of the Philippine Church, responding to the call to action the Pope’s Laudato Si’ encyclical. On July 10 the Permanent Council Meeting of the Bishops’ Conference of the Philippines will host a presentation of the petition campaign, and a series of events will follow throughout the country. For instance, the GCCM will host a conference on July 11 to launch the petition campaign with leaders from dioceses of the Luzon region, and 3 more events will take place throughout July for leaders from dioceses of the regions of Visayas, southern Mindanao and northern Mindanao. The climax of the campaign will be the Season of Creation, which runs from September 1 (Creation Day) to October 4 (Feast of St Francis), as proposed by the Philippine bishops in a 2003 pastoral statement. The GCCM has proposed Catholics from all continents to follow the example of the Philippine Church and other Christian denominations, by creating a Season of Creation website. The petition’s goal is to collect at least 10 million signatures addressed to world leaders in the U.N. COP21 summit in late November, asking them to take bold action to keep the global temperature increase below 1.5 degrees Celsius. The signatures will be delivered to world leaders in coalition with other faith-based and secular campaigns, to show that citizens of the world are deeply concerned about climate change and won’t tolerate inaction. The campaign is taking off in all continents and already has 20,000 signatures, even before the start of the massive grassroots outreach that will take place from July onwards. The petition can be signed both online at the GCCM website and offline through downloadable petition sheets. It is good to keep in mind how symbolic it is that the Philippines is mobilizing at such a large scale, given this is one of the most vulnerable countries to the impacts of climate change. The tragic Typhoon Haiyan of 2013, which killed around 15,000 people, was a sad premonition of what many experts consider will be the new normal in the future of the Philippines. The Philippines naturally receives a large amount of severe tropical storms each year, but climate change is worsening the intensity and frequency of these storms, and the increase of the sea level makes them more deadly. The picture is even worse considering that a large fraction of the 100 million Filipinos live in poverty and are not prepared to cope with the climate’s disruption. Now it’s the rest of the Church that will mobilize in the rest of the world, in solidarity with our brothers and sisters in the Philippines. We pray that Laudato Si’ will awaken our Catholic family worldwide, to take action for climate justice. And we are sure that we’ll rise up to the challenge.